Do you not begin diving in earnest at Miyako Island? You make your debut as a diver in a minimum period of 2days, too! Scuba Diver is our entry level scuba certification course during which you will learn the fundamental knowledge and skills to safely scuba dive in open water. 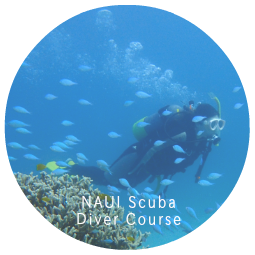 When you complete your class you and your buddy will be free to explore and discover the many wonders of the underwater world and, you will have earned a NAUI Scuba Diver certification card, the most respected diver certification card in the world! 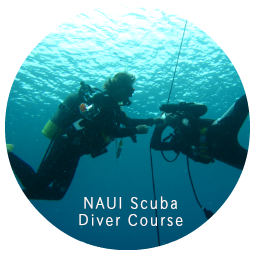 The following year, in 1960, NAUI was incorporated in the State of California as a non-profit educational organization. We have a dive master and an instructor more than approximately 50, 000 in the base more than approximately 100 countries in Asia, Australia, Europe, Africa, Japan including the United States. The C card is abbreviation of "Certification Card". It becomes a certificate proving that you acquired diving knowledge and a technique. C card is issue depending on each rank. 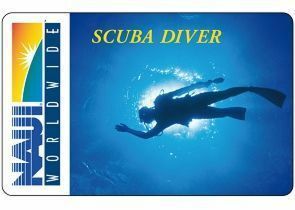 The C card proves the authorized diver in all the countries of the world. 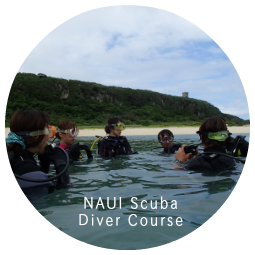 You go a restricted confind water (skill exercise in the place to touch the bottom) and marine training (open water), the subject class based on the program of the NAUI scuba diver in 3 days. Please do home learning while watching the teaching materials and DVD of NAUI beforehand in the course for 2 days. You may enjoy Miyako Island sightseeing by home learning more. 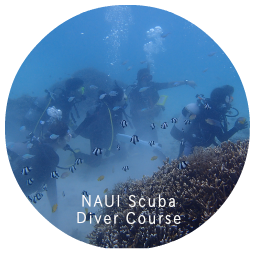 You can apply at the same time of a NAUI Scuba Diver Course and NAUI Advanced Scuba Diver Course. In this case a schedule of 5days is necessary, and price is 10% discount. We will claim the text charges 20,000 yen in the case of 2 days course. Healthy and 15 years or older. You can join as NAUI Junior Scuba Diver in the case of 14 year old from 10 years old. Currently the rules state that for a single no decompression dive, you should not fly go to altitude for at least 12 hours.These are guidelines only, there is no guarantee that these recommendations will prevent decompression sickness.Currently there are no guidelines regarding diving after flying.